Following is a post I made to Utahrafters after a trip that Anja and I made in inflatable kayaks. This picture shows the silt banks in the Dirty Devil Arm, from when Lake Powell was at full pool. I’m going out on a limb by making this post and probably deserve to be ripped on for doing what I’ve done. I think there is a bit of an issue with the presumed flow thought to be needed to boat this canyon. I think the higher flows that would make the upper part of the river less arduous would make the lower river a bit dangerous for paddlers who aren’t very proficient with whitewater boat handling skills. So anyway heres what I’ve got to say. During the trip I had dreams of waking up and finding no water in the river. I could see every day that the water was dropping out from under us but couldn’t tell how significantly until I got back home and looked at the USGS graph. Anyway, I’m writing this a bit humbled because I feel lucky to have “gotten away” with running the Dirty Devil River. We put in last Thursday at the end of the Hanksville dump road and went to Hite in 5 days. Started with about 160 cfs (on both the Poison Springs and Caineville gage) and finished with about 90. The first two days were maddening trying to stay with the channel which was at times only as wide as an IK. Made 15 miles the first day and 17 the second. Lots of profuse swearing while getting out of the boats in search of deeper water. After Twin Corral Box Canyon the river became more incised and quick water with neat little (albeit boney) rapids were the rule for the next whatever miles to below Fiddlers Cove Canyon. Made 23 miles the third day, and 25 the fourth. About 15 miles above Hite the silt banks started to become prominent between narrow canyon walls. In places the river became narrow (15’) and the current was ripping much of the time piling into under-cut sandstone cliffs then pouring off at a right angle downstream. Once we broke out of the narrow canyon walls and into the wide expanse of mudflats approaching the Colorado river I could see the gradient of the mudflats falling away and became a little nervous. The stream became incised in mud again (about 6 feet wide) with fast standing V waves from bank to bank. Luckily there were no strainers of tamarisk brush or anything else. I can imagine how this segment is continuously morphing, but I don’t know what to suggest for a scout because of the soggy nature of the mud flats. Maybe I’m making a bigger deal out of it than it is but this trip scared the crap outta me in more ways than one and I wouldn’t do it again under similar circumstances. The scenery is every bit as big and dramatic as anywhere I’ve ever been in the southwest. Poison Spring Canyon road was, what looked to be, bladed when I floated past. I’d say the “best part” of the scenery isn’t necessarily above or below Poison Spring. It’s all staggering and did I say big. I’d say somewhere between 250 and 500 cfs would be what I would shoot for as an optimum flow for another trip. During the trip it occurred to me that the water had recently been quite high so when we got home I did some looking around online. I found the following pic that my friends Ray and Tim took from one of the overlooks last October during a flash flood with an estimated flow of over 20,000cfs. 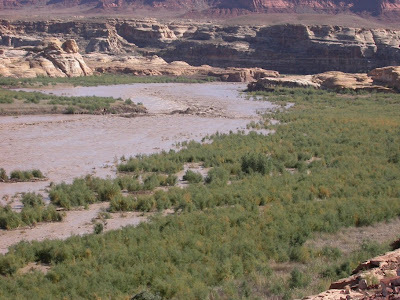 There isn't much for scale in the picture, but if you know how big the tamarisk get in riparian areas of Utah you get a bit of an idea of how big those waves are.